Ananka's Diary: Who's Breeding Gigantic Beetles? Not long ago, a suspicious package arrived at the Mohnton, Pennsylvania post office. The return address was a town in Taiwan and its contents were listed as "toys, gifts, and jellies." Yet something was moving around and scratching inside of the box, and the local postmaster was pretty sure that it wasn't fruit preserves. The package was sent to Philadelphia where it was X-rayed. Inside, customs officials found more than two dozen enormous Hercules, rhinoceros and Goliath beetles--all five to six inches in diameter. Many of the beetles were labeled by gender, which means the recipient was probably intending to breed them. Of course in Japan, these types of bugs are used in beetle battles. Is it possible that the (not so) bloody sport is already being played in hidden rooms across America? Beetles... They go crunch when you squish them! XD I thought there were only beetle battles in China, Tawain, and Japan... Maybe there is a secret beetle battle somewhere in America... But Tawain is known to have strange foods (also China, Korea, and Japan). Ewwww...some people actulllay eat them!!! Hmm... Many reported glowing orbs as aliens. I remembered that ghosts can also take the orbish shape too... What do you guys think?? 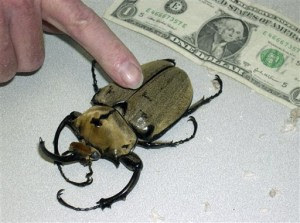 I don't mind beetles, but there is know way you could make me eat one :o! Oh and I saw a show where people where having magots (baby flies) on spagetti! GROSS!!! That's a creepyly big beetle! For some reason, I just thought of the delivery truck from The Empress's Tomb. Tasty Treats, was it? 1) What the heck were these beetles doing in Taiwan? According to what I found, they're tropical rainforest dwellers. And Taiwan is largely industrial, and certainly not tropical, no? 2) Why label their genders? Again, according to what I read, male and female Hercules beetles look so different, that they were originally thought to be different species altogether. I went to a weird food website and they were selling CAT INTESTINES!!!! battle beetle, i chose you! I just had a good idea. When we get back to the States I will start a Kiki Strike play/movie. Woe betide Hazel if she doesn't participate!! And in contrast to what Carmela said, can you promise to NEVER make the series into movies? That would completely ruin it and it doesn't let my imagination run as rampant as it's accustomed to doing. I completely agree with Patsee and sekrit7, NEVER make Kiki Stirke or allow anyone to make them into a movie. 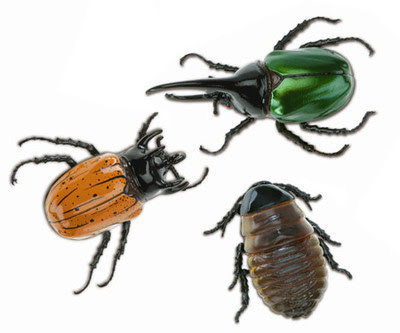 The beetles legs look icky. Hmmmm. I'm still not sure. Kiki Strike is waaaay too good to get stuffed up in a movie. You will have to be the director or someone who has a say in everything for the Kiki Strike movie. The Series of Unfortuneate Events movie is one of my faves, even if they are 'derailed' from the true plot of the books. But it's still sad. holy fart! those are huge! ewwww.. i only mind disgusting bugs.